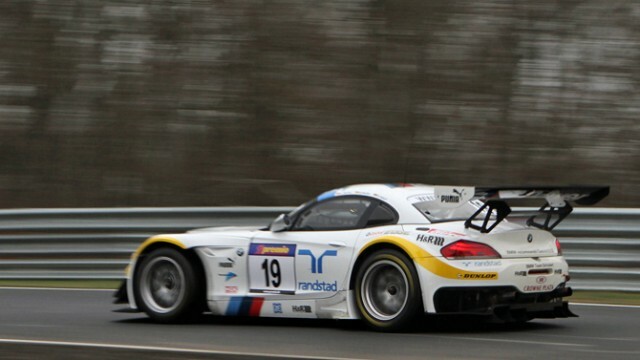 VLN: Double Podium for BMW Team Schubert. The BMW Z4 is a rear-wheel drive sports car. It follows a line of past BMW roadsters such as the BMW Z1, BMW 507, BMW Z8, and the BMW Z3. The Z4 replaces the Z3. First generation production started in 2002. Claudia Hürtgen, Dominik Schwager and Dirk Adorf crossed the line in second place at the Nürburgring-Nordschleife, while team-mates Uwe Alzen and Nico Bastian came home behind them in third place. Victory went to Porsche drivers Jochen Krumbach and Marc Lieb. The number 19 car, which finished third on Saturday, had started the season with a fine win two weeks ago – and for a long time victory number two seemed well within the grasps of the BMW Z4 GT3. Closely watched by BMW Motorsport Director Jens Marquardt who was on site, Alzen and Bastian had led for long periods of the race and were the only car among the front-runners to have come in for their third and final pit stop when the DMV 4-Hour Race was forced to abort the race prematurely due to heavy hail. As a result, the two BMW Team Schubert drivers dropped back from first to third place. Despite this, the general feeling in BMW Team Schubert was one of great satisfaction after another strong performance in the legendary “Green Hell”, which will host the 40th running of the Nürburgring 24 Hours on 19th and 20th May 2012.